AP&T’s new moving bolster is safer and more flexible. It can be conveyed in and out of the press in any direction, allowing it to be adapted to suit conditions at the individual factory and work with quick changes. The bolster’s drive is entirely electric, for precise control. It is also possible to easily execute the entire tool change with just a button, which is helpful for customers with a more automated factory process. For added safety, it has an optical scanner which continuously registers what is going on in front of the bolster while working with the control system. AP&T has developed a new generation of Moving Bolster for quick and safe tool changes. Moving Bolster is designed for tools weighing 30 metric tons and above, and is available for all of AP&T’s newly manufactured presses. 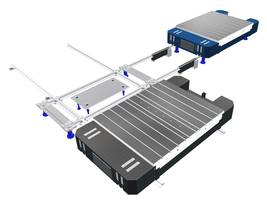 “The new generation of Moving Bolster allows us to meet our customers’ needs for a modern and versatile solution that enables easier change processes, including short setup times and high availability,” says AP&T Manager Development Press Products Mikael Karlsson. In addition to moving bolsters offering a greater degree of freedom in general compared to conventional surface tables, AP&T’s Moving Bolster also offers several other conditions that enable highly effective production. “First and foremost, the solution is very flexible. Moving Bolster can be conveyed in and out of the press in any direction, which means it can be adapted to suit the conditions at the individual factory as well as enable quick changes. Furthermore, its drive is entirely electric, which results in robust and precise control. It is also possible to execute the entire tool change using a few easy clicks of a button — an important advantage for customers with a highly automated process,” says Mikael Karlsson. Safety has been emphasized during the development of the new Moving Bolster. As a means to minimize the risks faced by operators and other personnel, AP&T’s Moving Bolster is equipped with an optical scanner which continuously registers what is going on in front of the bolster, and it communicates with the control system. The scanner can be programmed so that the area in the direction of motion is divided into an outer and an inner safety zone. If a person or an object is discovered to be in the outer zone, the speed is automatically reduced. If a person or an object is discovered to be in the inner zone, the Moving Bolster stops completely. The first customer installation of AP&T’s new Moving Bolster will take place this fall.